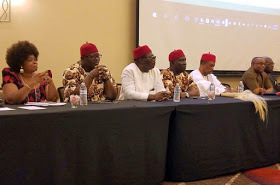 The Igbo World Congress, (IWC), which will be hold at Ascot Hotels, Enugu on Friday are expected Prominent Igbo sons and daughters including South East governors, royal fathers, members of Ohanaeze Ndi Igbo, Igbo leaders of thought, deputy Senate President, Chief Ike Ekweremadu to to be present. Others expected at the event include, Senator Enyinnanya Abaribe, Minister of Science and Technology, Dr. Ogbonanya Onu; former governor of Anambra State, Mr. Peter Obi; former CBN governor, Prof. Charles Chukwuma Soludo, business mogul, Arthur Eze and the founder of Centre for Value in Leadership (CVL), Prof. Pat. Utomi. The summit, organised by World Igbo Congress (WIC), would feature lectures, life-time award presentation to distinguished Nigerians including Ebitu Ukiwe; Prof. Anya O. Anya; Mr. Arthur Eze, among others. This was contained in a statement signed by the chairman of WIC, Mr. Joe Nze Eto and made available to newsmen in Awka. According to the statement, the group is expected to discuss various issues concerning the Igbo nation and her economy and the best way to move it forward among other key issues.